EL PASO, Texas (KTSM) - When it comes to bullying, most of us picture a young child. But one El Paso mother says that for her son, the tables have turned. 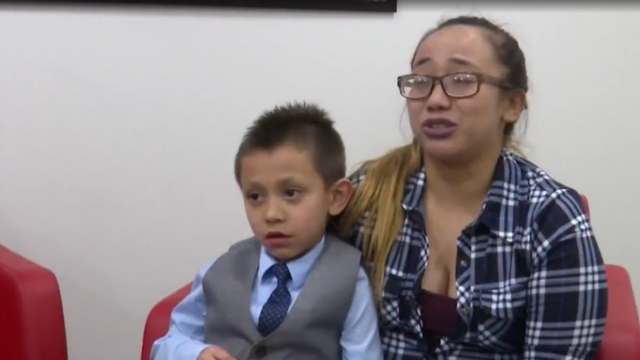 "I was hurt, angry, (and) upset because I trusted my child to that teacher, and she did that to my son," local mother Priscilla Alvarado tells KTSM tearfully. Alvarado claims her 6-year-old son, Matthew, was the target of physical and mental abuse at the hands of his kindergarten teacher at Ysleta ISD's Sageland Elementary School. "She would cut his hair, she would hit him in the head," she said. "I would tell him that we're going to go to school and he would be terrified." The mother says the alleged bullying began in September of 2018 and continued until this past February when she finally withdrew him from the Lower Valley campus and enrolled him in another. "I (felt) sad," Matthew told KTSM of his experience. "She kicked me." In a statement to KTSM, the district said the teacher is "on paid administrative leave pending an investigation." Alvarado feels like the measure is not enough. "To me, it's upsetting because the way I see it, you abused the child but here's your reward, we're going to put you on a vacation, you're going to continue to get paid," she explained. Now, the mother wants to know why the teacher allegedly mistreated her son. "Did she not have patience for him? Did he do something? Did my son remind her of somebody?" she wondered aloud. Alvarado says she hopes her son's story will help other parents in similar situations speak out. "I hope parents do speak up and come forward so justice can be done for my son and for other kids," she said. Alvarado says she has filed a report with Child Protective Services but has yet to hear anything from its investigators. As for Matthew, his outlook on school is slowly but surely improving at his new campus. "It's getting there. It's not 100 percent, but he's getting there," Alvarado said. "Every day it's a challenge for me to get him to school...but it's not as bad as it used to be."